Caporale says he has played music as a hobby since age 9, from formal piano studies to rock bands, and gravitated as an adult to composing and songwriting. “There is an analogy between music and business,” he says. “When you write music, you’re basing the foundation of the song on knowledge you have of music theory. You put a new twist on it to create something unique. When you can make that connection between composing and developing business strategy, people can relate and apply it and it’s more fun,” he says. While Caporale’s day job is President of Sequent Learning Networks in New York, where he helps businesses develop product and management strategies, he says the wisdom his book shares is based more on his previous experiences in management, marketing, and strategic planning at large companies. 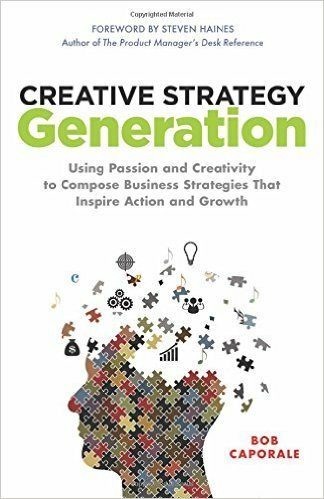 He calls that last proficiency “the most critical to bringing a strategy to life … that unseen force that drives people not only to act, but to act differently—from their past, from their present, from their otherwise predestined future.” It’s all about that passion and creativity in the book’s subtitle. Watch Bob Caporale talk about creative strategy here.